When Carrie asked me to be a part of her bookclub as a host, choosing a book was easy. I have wanted to read The Adventures of Tom Sawyer for a long time; in fact, I have actually intended to read it every year for the past several years, but it always gets pushed to the bottom of the stack because as much as I wanted to read it, there’s always something else that’s just slightly more interesting or urgent. That I haven’t read it or The Adventures of Huckleberry Finn has always been a source of mild embarrassment, made more acute by the fact that I have a degree in English education and have almost enough graduate English credit hours to have a master’s degree. I taught high school English, for Pete’s sake! Still, somehow in all my education, no one ever forced me to read this one, and since I’ve only lately begun to force myself to make reading selections based on anything but absolute necessity, sheer pleasure, or morbid curiosity, my knowledge of the American literary canon had some gaping holes. I’m happy now to say that I’ve closed one of these more noticeable gaps, and I enjoyed doing it. First, I had built this book up in my mind to be something that it isn’t at all. I think after years of laboring through obtuse minor works of literature, I expected this one to be hard to understand and complicated, but it is neither. Why didn’t we read this, then, instead of something like S.E. Hinton’s The Outsiders way back in seventh grade? I have nothing against The Outsiders at all, but Tom and Huck are definitely more important cultural icons than Pony Boy and Johnny. I suspect that as a college-bound, Advanced Placement-taking high school English student, I was supposed to have read this at some other point in my education, but I didn’t. Yes, there are gaps. Isn’t this the epitome of “cool” adolescence and absurdity? I love it! I found myself smiling and chuckling often while reading this book. I’m so glad I read Tom Sawyer, and I am eager now to go on and read The Adventures of Huckleberry Finn as well as Mark Twain’s other novels. If you’re a Mark Twain aficionado, which of his books is your favorite? Thank you, Carrie, for the nudge to do this! I am so happy to have experienced this great piece of American literature! 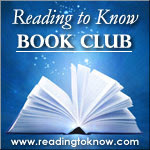 I also shared a portion of my thoughts above at Reading to Know. 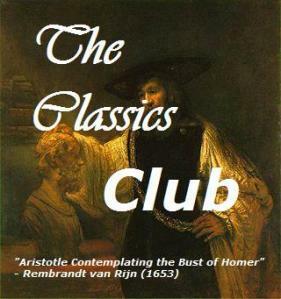 Click over to join the conversation about this classic work of American literature! Tee, hee, yes, I love those examples too. Boys are such funny creatures! 😉 I like your word choice: purely joyful incorrigibility of the boys. I’m so glad you chose this book for the book club, and I look forward to hearing your thoughts on Huckleberry Finn later. I’m wishing I had had time to read this now. I wasn’t too crazy about Tom, from what I could remember about him, but having three boys, the excerpts you shared make me smile. Some of his other escapades had me concerned, though, and I’ve been awfully glad my guys were not like him in those regards! Amy – we’re listening to this on Audio book right now, and I, too, was so amazed at how “easy” it is — and SO funny! My kids are laughing each and every time we listen. There is a state park here that offers cane pole fishing a la Tom Sawyer. How cool is that?? This review was so much fun to read! I read Tom Sawyer in junior high, and this makes me want very much to revisit it. Well, I was an English major, and I never read this either, although we did read Huck Finn in high school. I’ve also never read Jane Eyre, which I hope to remedy via the Classics Club. Shocking, eh? I’m so glad that you picked this one, really! If you hadn’t, I would likely never have revisited it and never read it to my own kids. It gave me a new perspective on the book (love the humor!) and I will look forward to reading it with my boys on down the road.